You pick up a request to supply clindamycin on your ward. The patient concerned has severe tonsillitis and laryngitis. This seems a little usual and so you investigate further. Your local guidelines suggest phenoxymethylpenicillin or clarithromycin as first line options. However you note that the patient has a documented allergy to both penicillins and macrolides. The prescribing doctor is off the ward but the medical notes indicate that a microbiologist has reviewed the patient and recommended clindamycin. You review the spectrum of activity of clindamycin and remember that it covers a range of Gram positive organisms including Streptococci. The dose prescribed is 300mg every six hours which is within the usual range. You check the patient’s medical history and he does not have any renal or liver impairment or other significant co-morbidities. He is currently taking some soluble analgesia but does not normally take any regular medicines. Speaking to the patient, you discover that he will not be able to swallow clindamycin capsules and you quickly need to find out whether a liquid exists or if the capsules can be opened. 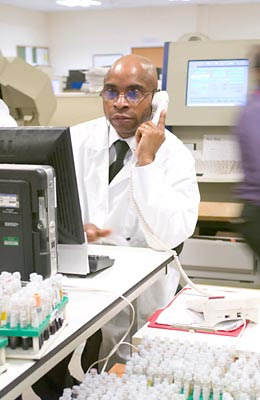 Fortunately your pharmacy logistics team help you to track down an oral suspension but it will take 24 hours to arrive. In the meantime you establish that clindamycin capsules may be opened and the contents mixed with water, although this is unlicensed practice. You check with the prescriber that they are happy to give the medicine in this way, and then speak to the nursing team and the patient about administration and the potential side effects to expect.